Advice on the use of test creation software. Expanded sections on performance testing. Single administration techniques for calculating reliability. Updated legal and compliance guidelines. 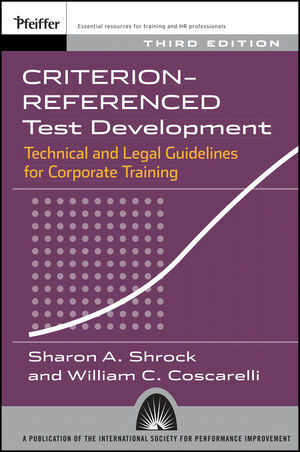 Order the third edition of this classic and comprehensive reference guide to the theory and practice of organizational tests today. Sharon Shrock is professor of Instructional Design and Technology at Southern Illinois University, Carbondale, where she coordinates graduate programs in ID/IT. She is the former co-director of the Hewlett-Packard World Wide?Test Development Center. She is a past president of the Association for Educational Communications and Technology's Division of Instructional Development and has served on the editorial boards of most of the major academic journals in the instructional design field. Bill Coscarelli is professor in the Instructional Design specialization at Southern Illinois University Carbondale's department of Curriculum & Instruction and the former co-director of the Hewlett-Packard World Wide Test Development Center. Bill has been elected as president of the International Society for Performance Improvement and the Association for Educational Communications and Technology's Division for Instructional Development. He was the founding editor of Performance Improvement Quarterly and ISPI's first vice-president of Publications.